Everyone can benefit from the ideas of yoga and mindfulness, no matter how old they are! This yoga series for kids is designed with 2nd-5th graders in mind. Karen Bullard brings her strong background working with youth, teaching in local schools, and instructing our Teen and Tween Yoga classes. When prompted during registration for your “Community Fitness ID,” please use the 10-digit phone number you use to sign into class. 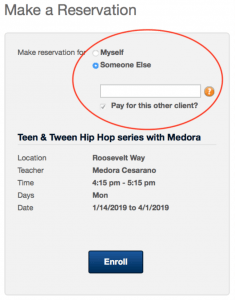 If you are registering for your child, please select that you are registering for someone else so that we have the correct person registered in class (see screen shot below).